Anil Kumar Sah’s daddy hundred and Sharad Vesawkar’s composed innings took Nepal to the command able total of 338 runs with the lost of 8 wickets in inscribed 50 overs. Nepal was forced to bat first, after losing the toss. Subash Khakurel and Anil Kumar Sah provided Nepal a flying start, but Khakurel couldn’t last there for long. They batted together for 4 overs with destructive run rate of around 9 runs per over. Veteran opener, Khakurel, showed some hope of returning back to his form with two boundaries in very first over of the innings, but that 8 runs was the only run, he scored in his entire innings of 10 balls. Sah contributed 28 runs in their 37 runs opening stand. Gyanendra Malla was given back his no 3 spot for consecutive second time. Malla finally ended his struggling innings of 21 balls during 11th over with only 9 runs behind his name. Paras Khadka (04) was sent back quickly this time. Sharad Vesawkar, who is commonly known as Mr. dependable of Nepali cricket, came down the crease to bat with Sah. Nepal were under deep pressure with 3 batsmen already saw the back way to pavilion with only 58 runs on the board. Then Sah-Vesawkar’s pair shared maximum 212 runs stand for 4th wicket. If it was a official match, then this could be Nepal’s highest ever stand for 4th wicket. Thanks to Anil Sah’s massive inning of 131 runs off 118 balls. His mouth-watering inning is flavoured with 17 fours and 3 sixes. Sah was dismissed by Nabeel Aziz in the very first delivery of 40th overs. Aziz’s 40th overs of the innings swung pendulum to East London XI’s favour as he bagged 2 more wickets in that over, one as a run out. Airee was very unfortunate as he didn’t get even a ball to face before he was sent back to pavilion as a victim of run out. Vesawkar missed his well-deserved ton by just 2 runs he was trapped in front of wicket by Nabeel. He smashed 98 runs off 86 balls and hinted us the arrival of his form before historical series. Three wickets in an over brought 2 news batsmen in the crease as Rohit Kumar Paudel and Sompal Kami was batting together. Yet another run out made things tough for Nepal as Paudel (11) was dismissed. Nepal just added 18 runs in-between 40 to 45 overs. Later on, Sompal Kami took the responsibility and took a charge. He scored 20 ball- 29 runs before getting caught off Sagar Joshi’s delivery. 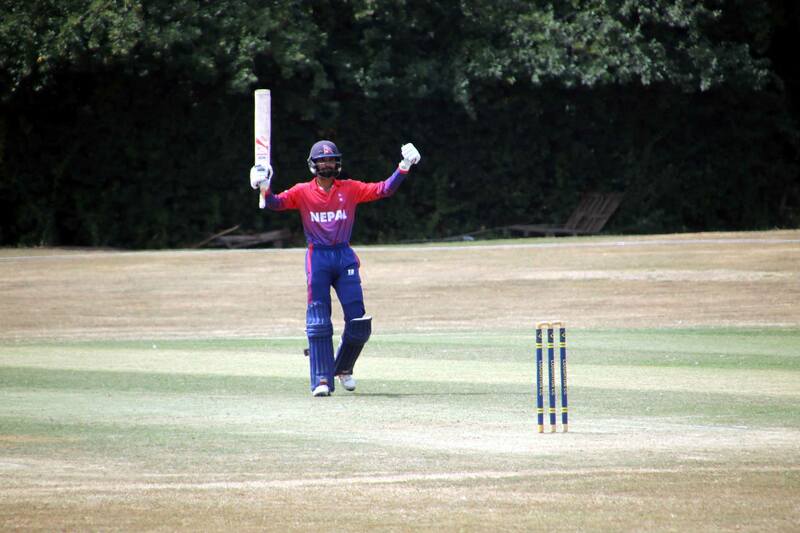 Karan KC smashed 13 runs off last over to finish the Nepal’s innings on high.He slammed a four and six respectively. Gauchan also stayed till the end with 9 runs. East London XI requires 339 runs to win in 50 overs.